Looking for those rare cheap iPad deals? These are the best prices around. So you're trying to track down some cheap iPad deals and the lowest prices? We can certainly help you out there. After all, it's not the easiest of tasks there is considering Apple's products have a tendency to be priced on the 'premium' end of the scale. But when new versions come out on an almost annual basis, there's plenty of room for discounts on the older ones. We're here to find reduced iPad prices on current-gen models too including the latest members of the family, the brand new 2019 incarnations of the iPad Mini and iPad Air. Finding iPad sales is slightly easier if you know where look. And with small-time manufacturers always keen to steal away customers with budget tablet options on the cheap end of the scale and big-time rivals Samsung and Microsoft trying to muscle into the iPad Pro's territory, Apple isn't as adverse to discounting its models as it used to be. We've seen chunky discounts on everything from the newest 9.7-inch iPad with Apple Pencil support to the incredibly powerful brand new iPad Pros. The older iPad Air and iPad Mini models are way cheaper than they used to be too, especially with newer version recently landing on shelves. We've compared prices below for every model still widely available. If you're a big fan of the Apple brand and operating system, we've got you covered for the latest cheap MacBook deals too. Here's a snapshot of the latest prices on a selection of the most popular iPad models. After that, keep scrolling for an extensive list of comparison chart prices for every iPad model on the market today. We've found the best cheap iPad deals so you don't have to. Apple's latest 9.7-inch iPad was released in 2018 and is very similar to the excellent model released in 2017 and arguably not really worth the upgrade if you have that one to be honest. The main new feature here is the Apple Pencil support, a feature usually reserved for the far more expensive iPad Pro models. That pencil doesn't come cheap though and has to be bought separately at £89/$99 - or you could get a third-party one for far less. The newest standard iPad is still a fantastic tablet though and is slightly bit faster and more powerful than the 2017 model thanks to the new A10 chipset. The 32GB 2018 iPad launched at the same $329 price as the 2017 version in the US. Over in the UK, the 2018 32GB iPad launched at £319, which was £10 less than the previous model. Australian buyers saw a nice AU$30 reduction with a new $469 price tag for the 32GB model. The 2017 iPad's prices are seeing some great reductions now on the original prices thanks to a newer version landing. The modern 9.7-inch iPads seem to be spiritual successors of sorts to the iPad Air 2. This iPad is a fraction thicker but contains an improved A9 chip with an M9 coprocessor for enhanced performance. In the US, prices for the 32GB model launched at $329, compared to £339 in the UK and $469 in Australia. The 128GB model's price at launch was US$429 / £429 / AU$599. Opt for the cellular/SIM card 32GB model prices are around US$469 / £469 / AU$669, with the 128GB model priced at US$559 / £559 / AU$799. Like we said though, prices are dropping nicely now although stock is being phased out in favour of the 2018 model as this version becomes increasingly difficult to find. The 2018 iPad Pro marks the biggest change to the display since the original model. The edge to edge LCD screen has been achieved rounding its corners and using a liquid retina display similar to that found in the iPhone XR. Apple has managed to create an 11-inch display, while keeping the chassis-size of the previous 10.5-inch iPad Pro thanks to a dramatic reduction of the surrounding bezel. The 120Hz display now comes with Face ID for unlocking too. The iPad Pro now comes with a modern USB-C connection but no longer has a headphone port. 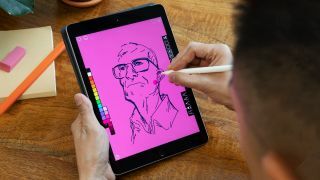 The new A12X bionic chipset makes the 2018 iPad Pros the most powerful yet and Apple’s really aiming for the professional creatives here with a big emphasis on how well the new Photoshop for iPad Pro works. It will effortlessly handle hundreds of high-res Photoshop layers with no lag. Apple also claim the iPad Pro is faster than 92% of other portable PCs. So it won’t surprise you to hear that the newest 11-inch iPad Pro has a high price to match the high spec with the entry level 64GB model’s prices starting at $799 / £769 / AU$1129. The 12.9-inch iPad Pro for 2018 enjoys the same new full-screen treatment as the new 11-inch version and looks spectacular too. The obliteration of the bezels of old, while keeping the screen-size at 12.9 inches actually means the new iPad Pro is smaller in the hand and lighter than previous version of this screen size. Internally, it comes rocking the same upgraded tech as the 11-inch model mentioned above - it's an absolute powerhouse for creatives. A bigger screen makes it even better for seeing your work and the new USB-C connection makes it ideal to connect modern external displays. The new iPad Pros can even support 5K displays. It’ll come as no surprise that the 2018 64GB 12.9-inch iPad Pro prices are far from cheap, starting at $999 / £969 / AU$1529. The 2017 10.5-inch iPad Pro has been discontinued now in favor of newer models, which is a shame as we quite liked the unique 10.5-inch size. You can still buy it from other merchants though, although it'll be increasingly difficulty to find new stock soon. You might get a nice discount on the way though. This iPad Pro model use an A10X processor, the older 9.7-inch version ran on the A9X chip. It's a faster processor than the older model although the performance boost isn't huge to be honest. The rear camera gets a modest megapixel boost and the front camera gets a bigger upgrade for a much clearer FaceTime experience. The 2017 iPad Pro screens now benefit from smaller bezels and an improved display - although the 2018 updates blow it out of the water now with even thinner bezels. The 12.9-inch 2017 iPad Pro is no longer supplied by Apple directly, but other retailers still have stock available and it costs much less than the newer versions, so it's certainly worth considering if you're after a cheaper iPad Pro price. Like the 10.5-inch model above, the 12.9-inch 2017 iPad Pro is no longer supplied by Apple directly, but other retailers still have stock available and it costs much less than the newer versions, so it's certainly worth considering if you're after a cheaper iPad Pro price. As for the tablet itself, it features modest improvements over the previous model, but if you get lucky you might catch some remaining stock in our price comparison chart above stocking it for a significantly cheaper price than the newer iPad Pro models. The iPad Pro 9.7 used to be the gold standard in iPad design, but it's been dethroned by several newer versions now. This model originally arrived in 2016 instead of an iPad Air 3 and still offers more than enough power and quality for someone thinking of stepping up to the Pro level of iPad, with the Pencil and Smart Keyboard on offer. That's great news for anyone who wanted pro features at a cheaper price, as it's the least costly of all the iPad Pro models around right now. However, you'll really struggle to find a new model nowadays, as most of the prices we see are for used or refurbished models. The new iPad Air is the first in the line we've seen since the iPad Air 2 in 2014 and given we had a thin 10.5-inch regular iPad released not so very long ago we thought we wouldn't see the name again. But this one has been worth the wait. That's because it's been given a significant performance boost, that makes it closer to the (far more expensive) iPad Pros than the regular iPads. The new iPad Air (2019) includes high-end chipsets and processors and also supports Apple Pencil and the Smart Keyboard. Prices for the new 2019 iPad Air start at $499 / £479 / AU$779 / AED 1999 for the standard 64GB version with prices shooting up for the larger 256GB or cellular versions. The pixel density on the retina display is very close to that found on the iPad Pro 11 and you're getting the same True Tone technology which will adjust the screen's brightness to the optimal levels for your environment. 16GB just isn't enough for today's apps and games. Unless you see a particularly cheap iPad Air 2 deal in our comparison chart above, you're much better off with one of the newer 9.7-inch iPads, which are successors to the Air line in all but name. Prices on most iPad Air 2 deals we see nowadays are for used and refurbished models. When we do see new units, they end up costing more than modern 9.7-inch iPads, which isn't ideal at all given the ageing spec inside the iPad Air 2. The combination of power, better screen, improved design and upgraded OS made the iPad Air 2 a compelling device at the time for sure though. It's still impressive to hold the iPad Air - even though it's now the thicker option compare to the iPad above. From the clever construction to the fast processor to the improved user interface, this iPad may be a ancient in technical terms now, but it will always have a place in our hearts. The prices below are almost certainly going to be for used or refurbished units, but you could get something of a steal if a retailer just wants rid of the stock. Otherwise, weigh the price up with the newer models towards the top of this page and see what's the best value option for you. The 2015 iPad Mini 4 finally received a brand new update in 2019, simply called the iPad Mini. While you'd be forgiven for thinking the design hasn't changed an awful lot over the years, you can spot the new version over older iterations via the improved spec. The stunning new retina screen has a 2048 x 1536 resolution, which is seriously intense for a 7.9-inch screen. The battery will keep you going for a superb 10 hours of web surfing and media playback. You're getting most up-to-date OS and brand new A12 Bionic Chip that even outstrips the most recent regular 9.7-inch iPad. If the standard-sized iPads are a bit too big for you to handle casually or take up too much space in your bag, but you really want something bigger than your phone for long reads, browsing the net or watching video content, the latest iPad Mini is going to take some beating as one of the best devices you can get. The prices are the main giveaway though and start off typically high, even more so than the nesest 9.7-inch standard iPad. The new iPad Mini (2019) has a starting price of $399 / £399 / AU$599 / AED 1599. The iPad mini 4 is widely regarded as one of the the best 7-inch tablets ever made. Apple has only just stopped making it now that it's finally rolling out a new version. It may look the same as the mini 3, but it's been slimmed down from 7.5mm to a wafer thin 6.1mm. It's also more powerful, has a stunning screen and the battery is still a 10-hour beast. The A8 processor was a good step up from the A7 inside the mini 3 so if you're going to play 3D games or throw around some of the more hefty iPad apps from the App Store, this is certainly your best option - all while being neat and compact.